The evening sun stayed high in the sky, shining orange-tinted rays on tabular icebergs floating in magnificent procession through the Weddell Sea on the eastern side of the Antarctic Peninsula. Gossamer smooth and glistening, the icebergs turn and tumble over time, gradually returning to the sea. The Weddell Sea is known as an iceberg factory. Huge structures generated by the Larsen, Ronne and Filchner ice shelves calve off and float through the water, which has traditionally made navigation difficult here. At least half a dozen ships, including Ernest Shackleton’s Endurance, were crushed and sunk in these waters. The ocean was calm from our deck on the Sea Spirit when I visited in December. Now there are renewed fears navigation could become more hazardous for ships after one of the biggest icebergs on record, measuring 5800 square km, calved away from the Larsen C Ice Shelf between July 10-12. The iceberg was already in play before it broke away so there’s no immediate impact on sea levels, David Vaughan, glaciologist and director of science at British Antarctic Survey, told Reuters. But it is expected to break up over time, increasing risks for ships, including passenger cruise vessels travelling to and from South America. Icebergs break off naturally from the ice shelf, so scientists aren’t pointing to climate change for this latest and major separation, just yet. However, they have been predicting for some time the Larsen C ice shelf could disappear in the next 10 to 20 years. 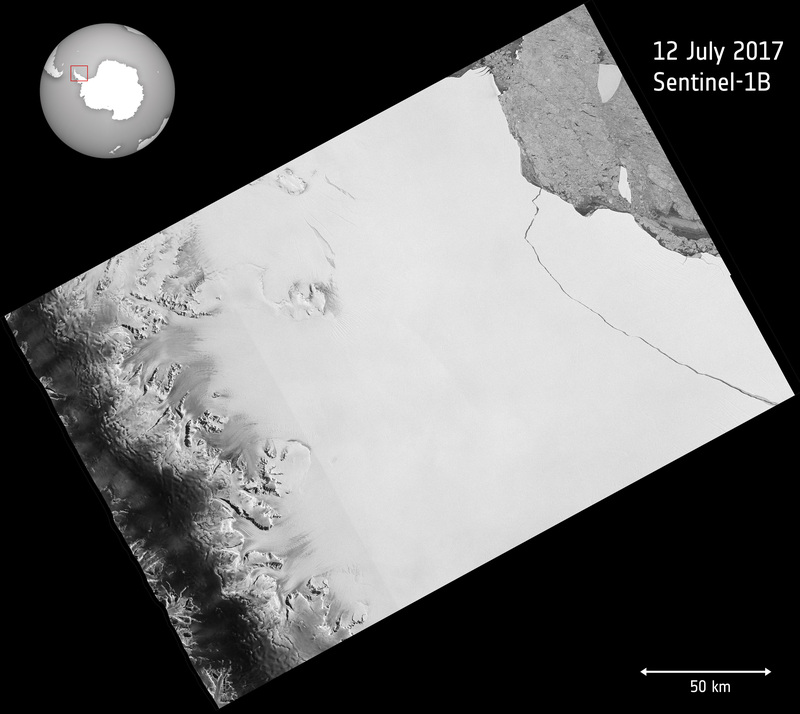 The Larsen A and B ice shelves, situated further north on the Antarctic Peninsula, collapsed in 1995 and 2002, respectively. And if the Larsen C ice shelf goes the same way, ocean levels could rise significantly. This latest calving episode has cut the shelf’s area by more than 12 per cent. It doesn’t rain or snow much in Antarctica, despite the stormy weather. When it does, the snow doesn’t melt because it’s too cold. Instead it builds up over many years to make large, thick ice sheets. Together, these sheets form a land mass nearly twice the size of Australia, holding 90 per cent of the world’s ice. In winter, Antarctica is covered by 20 million square kilometres of sea ice. This dramatically reduces to 2.5 million square kilometres over the southern summer. Still, scientists only have to look at satellite imagery of Antarctica’s sea ice – the largest natural mirror on earth – to see the effects of climate change reflected right back at them. Sea ice reflects the sun’s heat, so without it the sea absorbs more sunlight and warms up. In 2016, for the first time, Antarctic sea ice showed a slight decrease – a trend already witnessed for years in the northern Arctic. “We think 2016 marked the start of the reaction of Antarctic sea ice to climate change,” glaciologist Heidi Sevestre, research fellow at the University of St Andrews in Scotland, says. The main concern is global warming impacts will cause Antarctic ice shelves and glaciers to collapse into the oceans, something that’s been happening in the Arctic for some time. Evidence of climate change is less obvious in the Antarctic. But scientists say it’s already happening and the effects worldwide could be catastrophic. For example, if the northern hemisphere’s Greenland ice sheet melted, scientists estimate sea levels would rise by 7.8 metres. If the Antarctic ice sheet melted, sea levels would rise by 58 metres. And consider this: 700 million of the world’s population live within 10 metres above sea level – including those on vulnerable South Pacific islands. The Antarctica environment may be harsh but it hangs in a delicate balance, and according to the current science, we’re tipping the scales. Being there, the message was clear. As I studied the crevasses and cracks in the ice shelf, dark waves crashed against the brilliant blue hue of ice on the waterline. Suddenly a chunk of ice broke off from the shelf and collapsed into the ocean with a roar that stunned us. It was mind-blowing and deafening, and petrifying. And I wished the rest of the world could hear it.